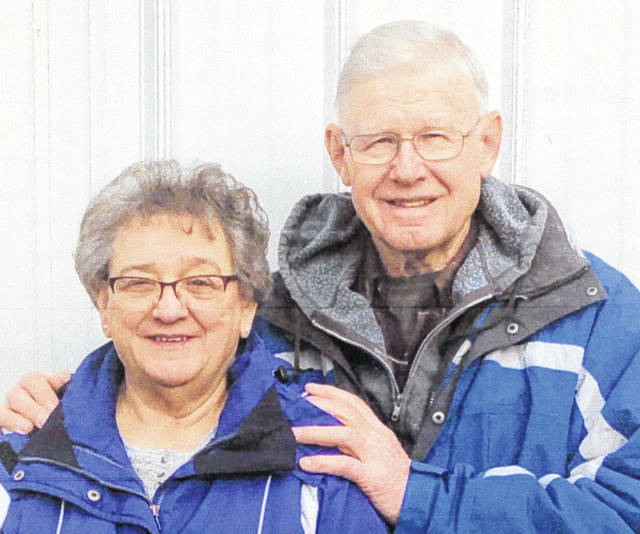 PLATTSVILLE — Janet and Lee Sargeant, of rural Plattsville, will celebrate their 50th wedding anniversary, Feb. 10, 2019, at a family dinner. Lee and the former Janet Bowden were married in the Pasco United Methodist Church, Feb. 8, 1969. The Rev. Harold Stockman performed the ceremony. Witnesses were matron of honor Judy Jones, sister of the bride; best man Joe Sargeant, brother of the bridegroom; bridesmaids Karen Bowden, cousin of the bride, Helen (Sargeant) Swihart, sister of the bridegroom, and Dodi May New and groomsmen and ushers Larry Worthington, cousin of the bridegroom, John Bowden, brother of the bride, and Stan Jones. Lee is the son of the late Herman and Edna Sargeant. Janet is the daughter of Maxine Bowden, of Sidney, and the late Coleman Bowden. The Sargeants have two daughters and sons-in-law, Sheri and Kevin Smail, of Conover, and Trina and Jim Jackson, of Sidney. They have six grandchilden. Lee and Janet are graduates of Fairlawn High School. Lee retired from Copeland-Emerson in 2006, after 34 years of service. He was also a part-time farmer. Janet worked at Amos Press for 21 years and at Dorothy Love Retirement Community for 18 years, before retiring in 2009. Janet enjoys reading, walking, jigsaw and crossword puzzzles and activities at First Baptist Church in Sidney. Lee enjoys helping on the farm. They both enjoy time with their family.